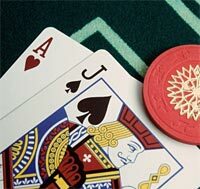 Double Exposure is a blackjack variation in which dealer’s both cards are exposed. Knowing the dealer's hand provides significant information that is very advantageous to the player that’s why there are other rule changes that favor the dealer. In Double Exposure the house edge is greater than in regular blackjack, despite this fact it still ranks as one of the best options in the casino, if it is played properly. The following tables show the basic strategy for Double Exposure. HARD 17 18 18 2, 3, 6, 7 & 8.